Funny little book of comics! It has been ages since I picked up a book of comic strips. I saw a couple of positive remarks about this book and grabbed it immediately. Once I started reading these comics, I couldn't put the book down. 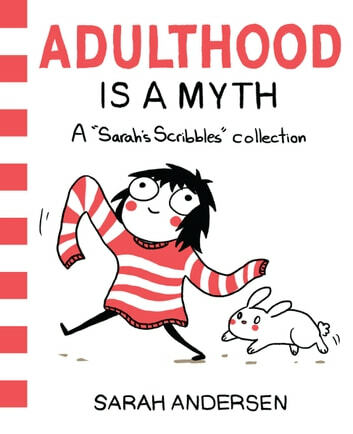 I had never seen the Sarah Scribbles character before and was really excited to see what this was all about. I was surprised by how much I was able to related to this funny little book of comics. There were entries about books, being an introvert, clothes, and all kind of little things that come up in life. Some of the comics made me glad that I am not the only one that has noticed some of these things. These were comics that I found myself constantly sharing with my husband. He likes it when I try to make reading a group sport. The artwork in this book wasn't complex but it worked well. I think that art really was perfect to illustrate this imperfect little character. I would recommend this wonderful book of comics. I think just about everyone can find something amusing in this awesome little book. I will be keeping my eye out for other Sarah Scribbles adventures. I received an advance reader edition of this book from Andrews McMeel Publishing via NetGalley for the purpose of providing an honest review. A good overall graphic novel that shows moments of a girl's life as she moves on. Funny, embaressing moments make you start to day, "I experienced that!" I thought that this was a fabuolas book. I highly suggest reading it. Love this cartoonist. I can relate to most of the cartoons. Mostly related to interpersonal relationships and girls.